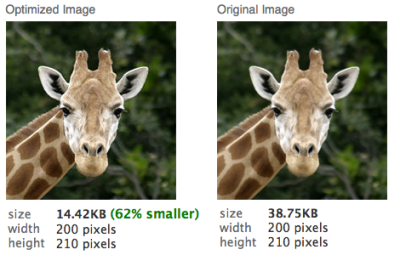 Image optimization is usually done to reduce the size of the image file and so that it can be loaded faster on the web, normally in computers with slow internet connection. So there are many tools available for desktops and macs which help in optimizing image size. But there are tools which help you do every thing online too. Here are 3 best tools that would optimize your images and make the file size smaller than the normal one. Enter the URL of the image file or upload a file of upto 300 Kb and convert into any other image format or use the same format. Web Resizer software helps to optimize images by resizing the size of the image file of any size, and you can add colors and increase or decrease the brightness of the image, and a good a good percentage of image size is reduced from the original one. Smush It – A free tool to optimize images, and they say : Smushit.com is a service that goes beyond the limitations of Photoshop, Fireworks & Co. It uses image format specific non-lossy image optimization tools to squeeze the last bytes out of your images – without changing their look or visual quality. You’ll get a report of how many bytes you can save by optimizing your images and all the changed images as a single zip for download. You can either upload images or just directly provide the URL of the image whose size is to be mushed. A zip archive with optimized images will be generated to you for download. Does smushit work for multiple image extention files? @Amit Bhawani: Yes, it does, but i am not sure what all type of image files are supported. I tried doing it with jpg, gif, png and bmp files and they all were smushed well. And the speed too is amazing. But u can reduce the size of the image OR Smush it as u say, even using the simple Microsoft office picture manager which every microsoft operating system has!!! It is useful for mac ppl !!!! Chetan great info, thanks for sharing. @Varun: I also read somewhere that the percentage smushed normally through the smush it website is higher than the Windows picture manager. And the quality of the picture is least affected. Compare that and check once. And for mac, yes these would come handy. Yeah chetan what you said is true. . . But dont you think that going into a website and then uploading the file into it and then again downloading the “smushed” image which is a zipped file and then unzipping is hell lot of a work to do, compared to an easy 1 click job in windows picture manager which gives you the same results !!!!!!!!! @Varun: There is a firefox extension to do that, will share that very soon. There would be no need to open a website, or to open the big picture manager or photoshop. @BM: Photoshop really takes more time than anything else. And do you think it smushes the size of the image? Not sure, but i think it does not influence the size, but is used to just make changes in the make of an image, its format or other within-image settings like color and brightness. Correct me if am wrong. I used to depend on online tools for image optimization until I started using Paint Shop Pro trial versions. But recently I stumbled upon Gimp which is almost as good as PSP and completely free. Those who are interested my try it out at gimp dot org. @Ajith Edassery: I’ve tried Gimp too, but I’m having a headache using it. This would help me big time..
Reducing size of image is always needed to bloggers to make there sites load quickr, thanks for sharing chetan. Cool.. this is very useful.. especially when i upload images to my blog and upload images in friendster.com friendster only has a limited size..